Just like your senior year is hardly like any year you have yet to experience, I want to be a photographer unlike other experiences out there. Because of this, I have decided to embrace a few core ideals, to help capture, share and preserve your senior year. Capture. I want to capture YOU. My greatest joy comes from when you not only look great, but your unique personality and character traits shine through. This all starts in our pre-session consultation, to the photo shoot and all the way through the editing process. The end will be images you will be proud of. Share. Today we live in a social media driven world and I embrace that. 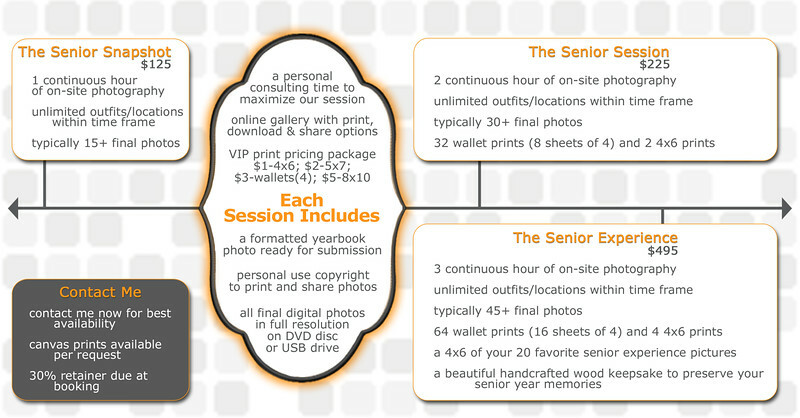 Not only will you receive all the final photos in full resolution with a print release. You will also get your very own personal online gallery. Through this gallery you can order prints, download your photos and even share directly to various social media sites. Preserve. Digital files are great, it's how we take pictures and show them off. But who knows where technology will be in 20, 10 or even 5 years for now. The one thing we do know is that a physical photo in hand is always a photo in hand. I want to help put professional quality prints in your hand and with my packages you can enjoy a very special VIP print pricing package ($1-4x6; $2-5x7; $5-8x10; $4-set of four wallets). For those of you that want more, inquire about our very special handmade keepsake box. Designed just for your senior year, you will be able to preserve not only photos but also key trinkets and mementos of this amazing year! Want to know more about what a "Keepsake" is? Click the link and check out a little more about it. When you are ready, let's meet to go over your senior portrait session and I can bring an example for you to see first-hand. It's time for something new, something fresh and something unique. Contact me today for booking availability.